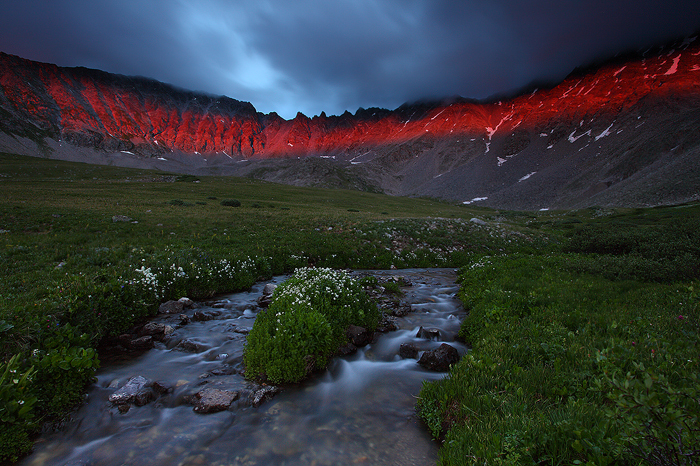 A cold and gloomy summer evening is briefly interrupted by an intense ribbon of red sunset light. This evening was another lesson in never leaving too soon. I made the hike up to Mayflower Gulch as dark storm clouds loomed overhead. I suspected the sun had made its last appearance of the day. Just as I was contemplating packing up my gear and hiking back down, this beautiful red ribbon of light appeared across the mountain range. It only lasted a matter of minutes, but was one of the most unique light shows I've witnessed. Do you prefer the look of a traditionally framed print? If so the print only option is for you. With the print only option you are free to take your print to your local framer and have it presented exactly the way you would like it. These photographic prints exhibit outstanding color stability and are resistant to both color fading and staining whether stored under lights or in darkness. The pure whites, rich blacks, vivid colors and clean highlights of this paper give it extraordinary clarity and an amazing sense of depth and dimension. Simply choose the size you would like. Stunning prints face mounted to acrylic for the richest color and greatest depth of any display method. Acrylic Prints are beautiful photo prints face-mounted to acrylic with polished edges. Face mounted photographs have a vibrance and depth without equal. The face of your prints is mounted to a crystal clear acrylic sheet and backed with a Dibond* backer. Face mounts give you quality that would be expected in the galleries of New York, for the walls of your home. With metal prints the brilliant surface offers a richness of color that makes viewers take notice. But they also solve the "problem" of framing. Traditional mounting, matting, and framing can be a time consuming and expensive process. Not so with Metal Prints, the metal surface is naturally smooth and rigid, and with a hanger attached to the back, they are ready to hang right out of the box. This is a great choice for a ready to hang contemporary piece of wall art at a more econonimal price. Canvas Gallery Wraps offer a superb way to display your photographs. What makes canvas wraps so popular is that they eliminate the need (and cost) of framing. Your Canvas Wrap is ready to hang on your wall, right out of the box. Once you see your Canvas Wrap, you'll understand why these are one of the most popular trends in decor and display. Canvas wraps are also a great option if you have a room that received a lot of glare. The canvas won't reflect the light like a traditional glass or acrylic frame will. Your personal billing and shipping information will be gathered on the next page on a Paypal secure server. If you are an international customer please contact us for a shipping quote.